Mary Ann Scott (Polly) that lost her horse and saddle to the bushwhackers, married Henry Schell Jr. before or a short time after his release from the Confederate Army. Henry and Polly settled on Big Sugar Creek at the end of the Civil War in a spot that became the village of Mountain, Missouri. Mountain is about nine miles northwest of Pea Ridge, Arkansas in McDonald County, it was located on the north side of the creek near the foot of a high mountain from which the post office derived its name. When the Frisco Railway came though the region in 1881 less than 20 miles east of Mountain, mail for that part of McDonald County was dropped off at Seligman and delivered from there to Mountain by horseback. The first stop out of Seligman was Mayflower, a post office in the home of John Vanzandt. From there he went to Schrader’s Store on Trents Creek and from there to Mountain. If Big Sugar was out of its banks, crossing was made by row boat or by swimming a horse, and the doctor often reached his patients by this mode of travel. Besides the post office, there was a water powered grist mill, blacksmith shop and general store, all owned by Henry Schell Jr, He is designated Henry Schell Jr. here, though the name Henry Schell appears frequently in the Schell genealogy. The official name of the village was Mountain but the trading post was known as Schell’s Mill. It was a busy trading post from post Civil War years up through the turn of the century. Mountain is shown on Missouri road maps today, though the post office was discontinued in the early years of this century. Before the good roads and automobiles released people from their stationary existence, Schell’s Mill drew trade from a wide area in southeast McDonald County, MO, and from over in Benton County, Ark, along the Arkansas-Missouri line. When folks living in the hills ran short of breadstuff they filled a toesack with corn, placed it on the back of a horse or mule, got up behind it and headed through the hills for Schell’s Mill. The miller took a toll of the meal to pay for the grinding and the customer took the balance home for cornbread. Henry Schell Jr. learned the millright trade from his father who owned a water mill three miles up Sugar Creek at the state line before the Civel (sic) War. Henry built a dam across the creek at Mountain that backed-up water for a millpost. High water washed out the first dam but the mill was salvaged. He then built another dam a short distance below the first one with lumber and logs. Water released through the flume spun the big stone burs (sic) with a hum and roar that could be heard throughout the little village. The millpond was a fisherman’s paradise and many people came to Mountain just to fish for perch, trout and eels. In addition to the industries operated at Mountain, he also owned the store and mill at Cyclone farther down the creek. He owned 400 acres of land at Mountain where he grew corn to fatten hundreds of hogs. Some days as many as 500 hogs would be rooting around the mill or wallowing and sleeping in the shade. Hundreds of others would be running on the free range in the hills. It was said of Henry Schell that he never had any idea of how many hogs he owned or how many people owed him money. He was a sharp business man and had a knack for making money with which he was very liberal. Nobody was turned away that asked for help. It was quite a treat for a youngster to visit the general store at Mountain with all its fragrant and strange smells of brought-on merchandise, Hoarhound (sic), peppermint and gumdrop candy at 10¢ per pound. Arbuckle coffee in the bean for 15¢ per pound, A 25-pound ham, $3.25. The mill, store and blacksmith shop supplied about all the population needs that could not be raised on the farm. Tobacco was sold by the hand and gingham and calico was sold by the yard. Somewhere in the 1880’s Schell’s, built a new home with pine lumber. It was quite a mansion for the time and location. The house is occupied as a home today after alterations and remodeling. It was a two-story house with a one-story north wing which was the family kitchen and dining room. Here Polly and the help served bountiful meals to the family and frequent guest, often customers that happened to be in the store at dinner time. A novelty in the Schell house was a dulcimer, a musical instrument played by tapping the strings with a wooden mallet. It would be a novelty today. In the years around the turn of the century, 4th of July picnics were held in many communities. It was the big event of the year and people looked forward to the celebrations. Some were held at Mountain and Baptist church grounds (now jacket). Come 4th of July, families began arriving early in wagons, hacks and buggies. Young ladies dressed in their finery smelling loudly of new gingham and calico. It was an ideal time to catch a beau. Young men that came no doubt were urged on by the same motives except, some came to get drunk and settle old grudges. Fights were numerous in spite of the more sober minded that tried to keep order. All that is left of the original village of Mountain is the former Schell residence, some rock walls and part of one stone burr that ground the grain. The stone burrs, said to have been imported from France, have been chipped and carried away by souvenir (sic) hunters until only a small section of one burr remains. Henry Schell, Jr. that married Polly Scott and owned the village of Mountain, was a son of Henry Schell the pioneer and Elizabeth Yocum Schell that homesteaded in McDonald County in 1845. Henry Jr. was three years old when his parents took up land at the junction of Otter Creek and Big Sugar. His land lay just beside Missouri joining Benton County, Ark. Henry and Elizabeth were the progenitors of the many generations of Schells that have been born in McDonald and Benton Counties and many other parts of the U.S.A.
At the time Henry Schell settled there the land was the home of the bear, wolf, deer, panther and wild turkey. The streams were full of fish and the water was fresh and sweet. Early settlers had to locate near water, either a spring or a creek, where water was available for household use. They could drink their fill of sweet creek water with no fear of pollution. To being with, the land had to be cleared of timber and scrubbed while farming. Just 18 years after Henry Schell settled in McDonald County, the Civil War cost him his life, but in the meantime he added to his homestead until he owned 1000 acres of land. Much of it was in the rich Sugar Creek bottoms. In 1852 Schell built a house on his homestead which is standing today. He hauled the lumber from Van Winkle’s Mill at War eagle in east Benton County with ox teams, a distance of about 35 miles. He had also built a carding mill, a water powered grist mill and a distillery that was a three condenser capacity. These industries were strung along the west bank of Sugar Creek just below the ford (Jacket Bridge) across the creek from Baptist Camp grounds. His industries pulled customers in from a large territory, some remained for days on the campground waiting their turn at the mills. Henry Schell Sr. was a prospering man until his business was interrupted by the Civil War. Four of his sons entered the Confederate army, Nathaniel 23, Fredrick 20, Henry Jr. 19, Phillip got in at 17; all of them survived the conflict to live normal lifetimes. By 1863 times were getting hard, business was ruined, law and order had broken down, Renegades, cut-throats and thieves known as bushwhackers had the population scared. Word was getting around in the settlements of house burning, robbery and some innocent people had been killed and others tortured. At this far away time it is hard to reason why anyone should want to kill Henry Schell. He was 53 years old and had children as young as one year old. Altogether he and Elizabeth had 12 children though some of them were grown and married. It is thought to have been a case of revenge but they killed men on both sides of the state line, some of them had no sons in the army (sic). There is no record of a robbery motive or damage to his property. Maybe his sympathies were on the wrong side even though he had to choose one side or the other. Or perhaps he was in the wrong place in those tragic times and accidentally got in the path of history as many others have. 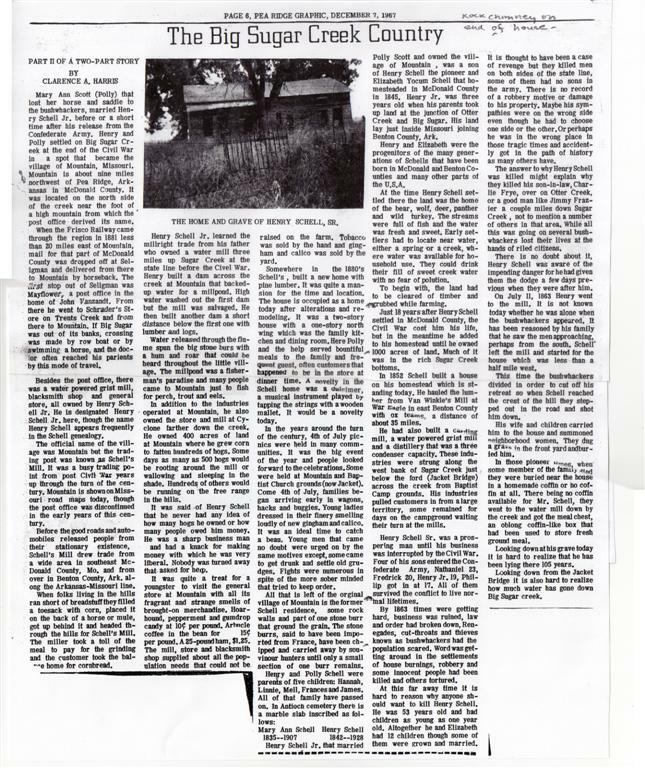 The answer to why Henry Schell was killed might explain why they killed his son-in-law, Charlie Frye, over on Otter Creek, or a good man like Jimmy Frazier a couple miles down Sugar Creek, not to mention a number of others in that area. While all this was going on several bushwhackers lost their lives at the hands of riled citizens. There is no doubt about it, Henry Schell was aware of the impending danger for he had given them the dodge a few days previous when they were after him. On July 11, 1863 Henry went to the mill. It is now known today whether he was alone when the bushwhackers appeared. It has been reasoned by his family that he saw the men approaching, perhaps from the south, Schell left the mill and started for the house which was less than a half mile west. This time the bushwhackers divided in order to cut off his retreat so when Schell reached the crest of the hill they stepped out in the road and shot him down. His wife and children carried him to the house and summoned neighborhood women. They dug a grave in the front yard and buried him. In those pioneer times, when some member of the family died they were buried near the house in a homemade coffin or no coffin at all. There being no coffins available for Mr. Schell, they went to the water mill down by the creek and got the meal chest, an oblong coffin-like box that had been used to store fresh ground meal. Looking down at his grave today it is hard to realize that he has been lying there 105 years. Looking down from the Jacket Bridge it is also hard to realize how much water has gown down Big Sugar creek.